I love artichokes in every way shape or form. And I love Middle Eastern food just as much, so when I came across several Lebanese recipes for stuffed artichokes, it was, as my kids aptly say, a no brainer. Oh, yeah, and the pine nuts - anything with pine nuts in it automagically makes it to my top 10 list. One of the nice things about this recipe is that it could easily be adapted to a vegetarian meal by leaving out the meat and substituting spinach, rice or even tofu. 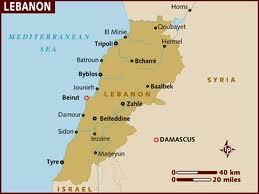 Located in Western Asia, Lebanon is at the crossroads of the Mediterranean Basin and the Arabic hinterland. The beautiful country sits on the shore of the Mediterranean sea and is bordered by Syria to its north and east and Israel to its south. Lebanon's rich history dates back some 7,000 years. Due to its location, Lebanon boasts a wide variety of starches, fruits, vegetables and seafood. Lamb and goat and chicken are eaten more frequently than beef and are most frequently grilled or baked. Garlic and olive oil are used in abundance and vegetables are often eaten raw or served pickled. Cut off the artichoke stems close to the base. Remove tough outside leaves, then gently separate the leaves to form a cup. Using a pairing knife, remove as much of the choke from the center as possible, being careful not to cut through the heart. Rub each artichoke with a cut lemon and place in a bowl and sprinkle with a little flour until ready to cook. Meanwhile, heat a few Tbsp. of olive oil and fry onions until just slightly golden. Add meat, pine nuts, garlic, parsley and season with salt and pepper. Next, boil artichokes in about 2-3 inches of water for 15 minutes until tender. Arrange them in a shallow pan and stuff each artichoke with meat mixture, then season to taste with salt and pepper. Squeeze lemon juice over artichokes and dot with butter. Mix flour with half a cup of water and pour into the bottom of the artichoke pan. Bake in 350F oven for 15 minutes. Serve hot with rice. Final Assessment: This was a simple, delicious and beautiful meal. As I mentioned, the artichokes are sprinkled with flour and a flour/water mixer is added to the baking pan before baking, but I have NO idea why. Every recipe I looked at called for flour, so I used it, but I can't say that it made a difference one way or the other....maybe one of my wonderful readers can enlighten me! This is really lovely. I have been following your food blog for a long time, and I adore the concept. I hope I did your beautiful country proud! The dish was wonderful!